Events in Paris this week have shocked people around the world. The brutal murder of journalists and cartoonists at Charlie Hebdo magazine – and of police officers and members of the public – seems to many to be a turning point and to throw into sharp focus the social and political conflict we face in open societies. 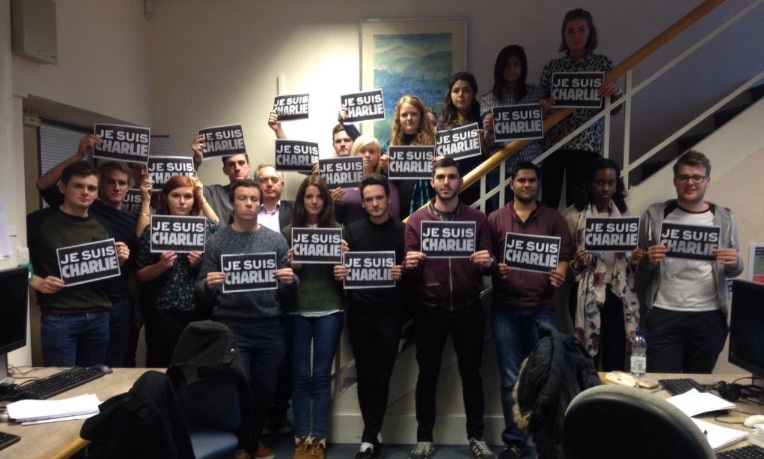 For some it was a clear attack on freedom of speech – leading to the “JeSuisCharlie” tag of solidarity in social media. Many praised the bravery of the cartoonists continuing their work in the face of death threats. For others it was an assault which justifies a tightening of security and how we choose to live. Yet others thought the attack had been unnecessarily provoked by the magazine satirising of the Muslim faith – and that satirists needed to compromise and avoid undue offence. Others have seen it as a cynical and brutal tactic to provoke a backlash against muslims which will alienate and radicalise more of them. So how should an open society respond to such a brutal attack on civilians? The country was no longer fighting a foreign war but the government felt under threat from forces it did not fully understand. It feared that some people were not fully integrated into society. Suddenly, in a single, terrible, unexpected event, many lives were lost. The government faced a danger that it had never seen before. How could it ensure that the country remained at peace and that the rule of law was upheld? To prevent journalists from giving a platform to dangerous radicals, it proposed some of the toughest legislation against free speech that the country had ever seen. Two measures in particular bordered on censorship. No: I’m not describing Great Britain now or even in the last century. This was 1819, when the country had just emerged from the Napoleonic Wars and Parliament was grappling with the aftermath of riots – including one called the Peterloo Massacre, when the army killed a dozen protestors. By the year’s end, Parliament had debated and passed six measures to suppress radical newspapers and reduce the possibility of an armed uprising. There were punishments for publications that were judged to be seditious and a bill to control the publishing of opinion not news. Protestors saw this as an infringement of their civil liberties and a curtailing of free speech. But at the time, many people in the country thought it was the right step. They feared a revolution. Today, of course, we know they were wrong. There was no revolution and the powers taken by the state did damage to press freedom which it took 3 years to reverse. But without the benefit of hindsight, the relationship between the media, the public and the state are not always black and white. As arguments continue about what provoked this attack and how to respond we need some perspective. That’s why some, like Guardian columnist Simon Jenkins, have argued it is important not to overreact to this week’s events – not to allow ourselves to be terrorised. I find myself in agreement with my former BBC colleague, Robin Lustig. Democracies or “the West” are not under attack. The language of war is inappropriate – to use it is to fall into the terrorists trap. Those who kill are criminals and need to be dealt with as such. Tolerance is a value to be cherished, but there is no virtue in tolerating those who murder. The only effective way to counter the threat posed by killers like the Paris gunmen is by good police work based on good intelligence work, carried out with full regard for the basic human rights to privacy and freedom of belief. A mature democracy must be able to tolerate those who preach against democracy. But it can never tolerate those who kill, or seek to kill, those with whom they disagree. It is not a difficult line to draw. In the meantime, we should remember and cherish those who pay a price for freedom of expression – in Paris this week, and around the world every week. ← An editor quits – sort of.